Laminate the two bottoms. 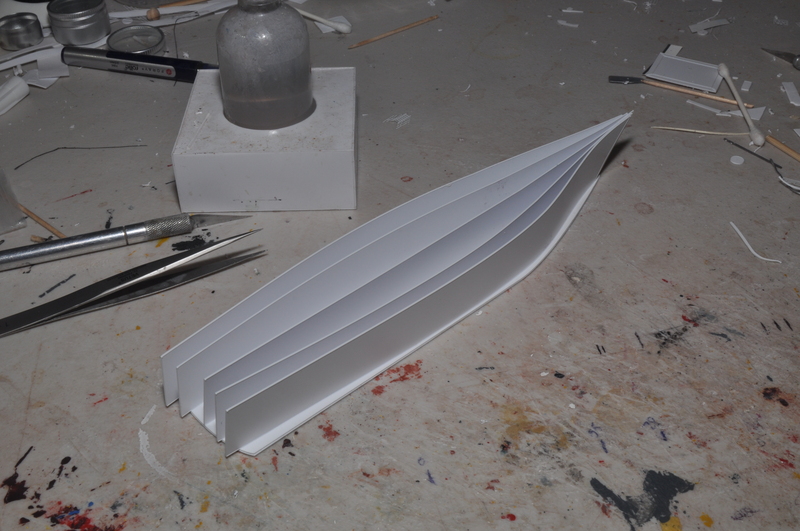 Then, starting at the center piece which is straight, glue the other four vertical spines in place, curving them as shown. At the bow, the center spine is aligned with the point of the bow, and the other spines are moved back by a few millimeters, so that they do not overlap the edge. At the rear, the spines may overhang; these will be trimmed later. 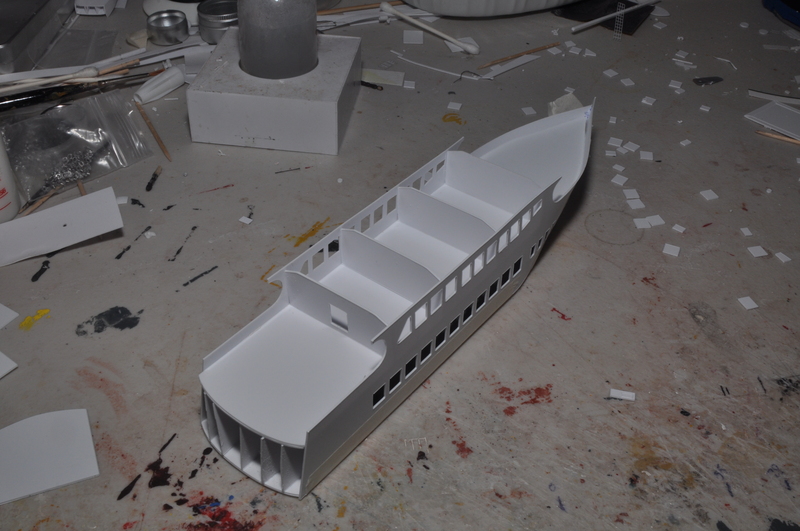 Laminate the two main decks.The center spine should match the decks in the center at both front and back. This show how the spines are set back at the bow. I use a piece of black electrician’s tape to “black out” the interior. If you are using acetate for glazing (not supplied), now is the time to apply. Keep the acetate away from where the sides will meet the main deck. Glue the sides to the bottoms and main deck. 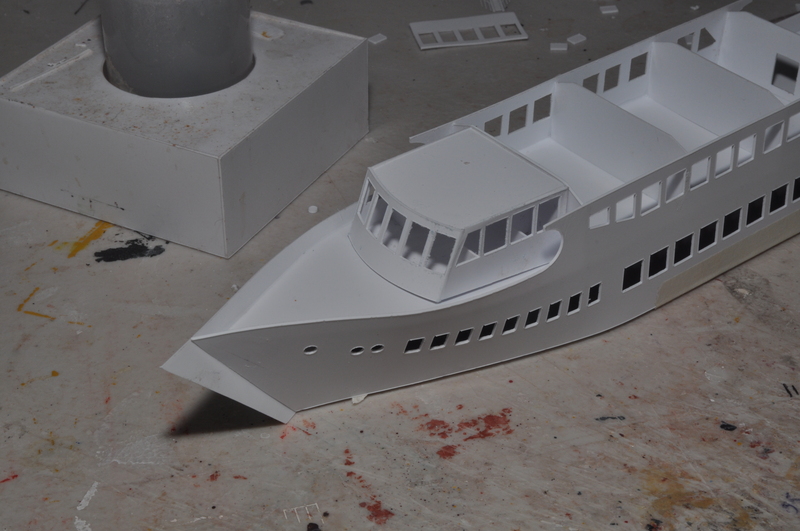 A good alignment point is the bottom rear of the side and the beginning of the stern curve on the bottom. I use masking tape to keep the sides aligned all along the bottom. Once the joints have set, position the four bulkheads as shown and glue into place. 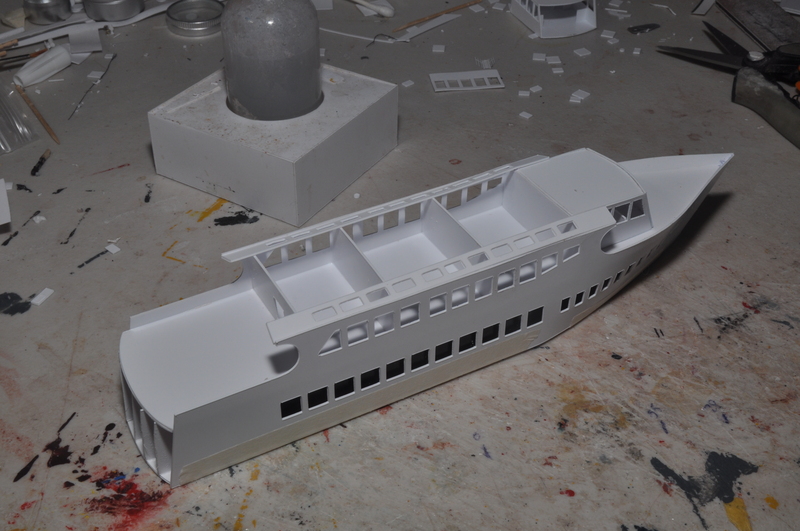 The front bulkhead should be placed just ahead of the first windows. You can probably eliminate one or two of the center bulkheads if desired. Leave the bow for a little later. 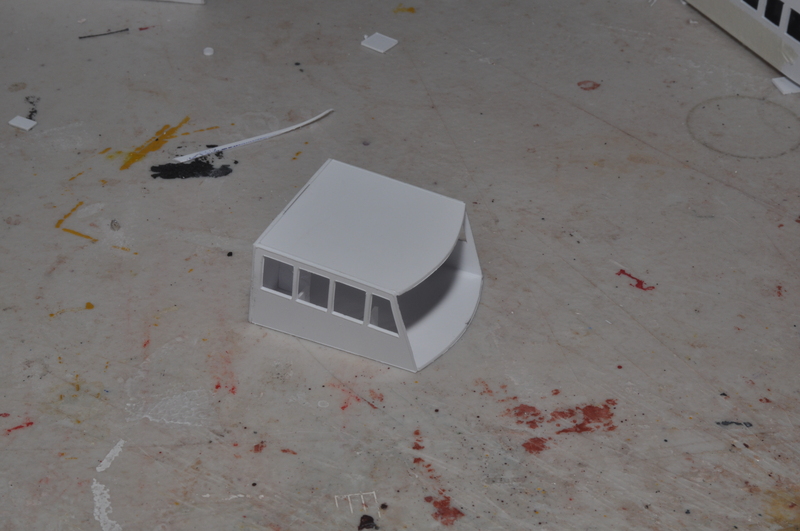 Assemble the front cabin (not the pilot house) as shown. I use the square window chads from the sides as small braces for the walls. If you are using acetate (not supplied), now is the time to apply. Glue on the front and then glue in place on the main deck. You can see how the sides meet at the bow. I’ve already trimmed the foremost side piece back so it meets the other side piece, I glue this together, then trim the other piece. Here I have glued to overhead windows in place. Glue the roof (not shown). Assemble the sun shade as shown, carefully bending it to the ribs. The rib that extends across the funnel opening must be trimmed. I inadvertently skipped a few steps but they are not too difficult. 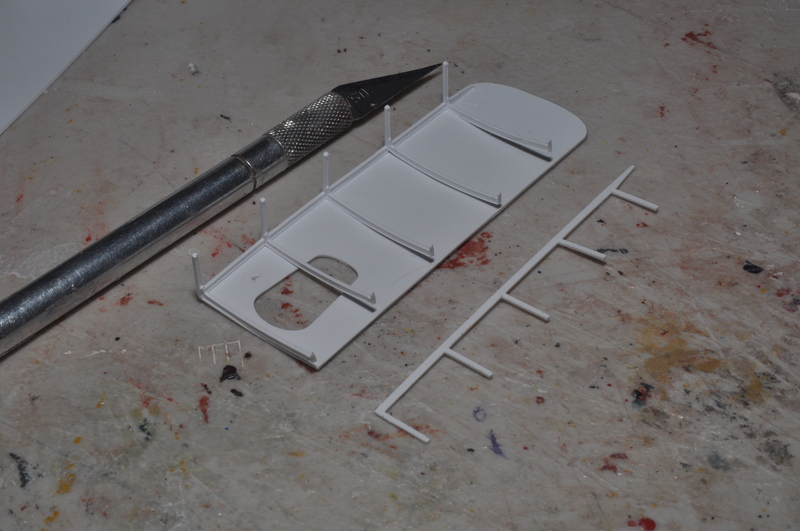 Assemble the pilot house and glue it so that the rear lines up with the space between the second and third overhead windows. 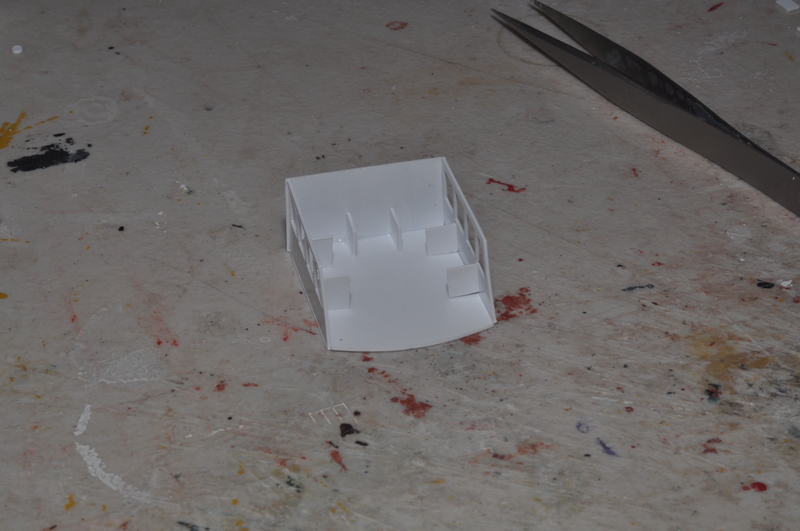 Use the sun shade assembly to position the stack. 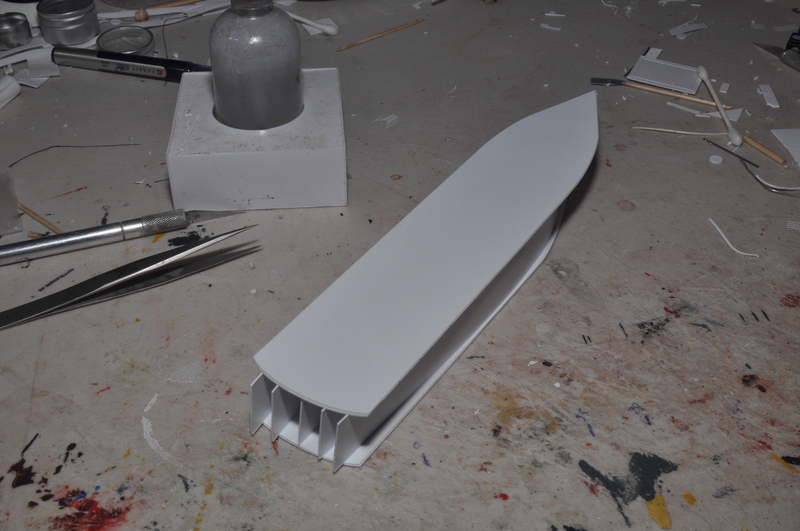 I remove and paint the sunshade assembly. 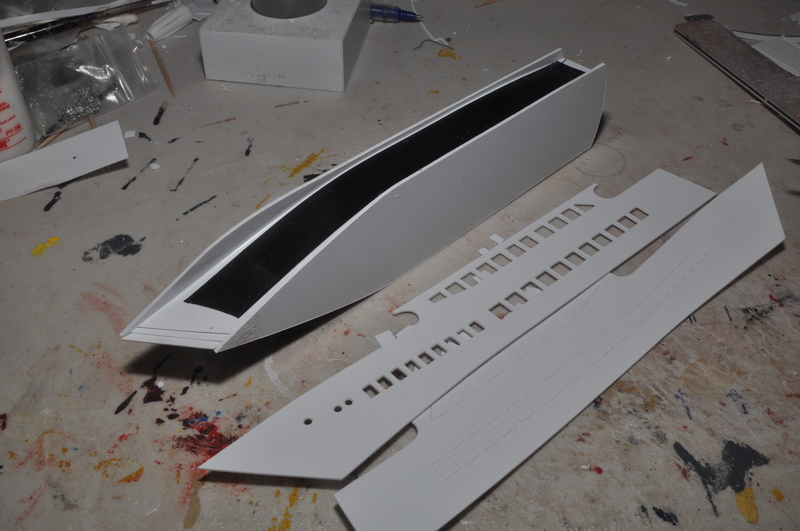 Then I apply the rub strips around the ship, following the line of the windows. 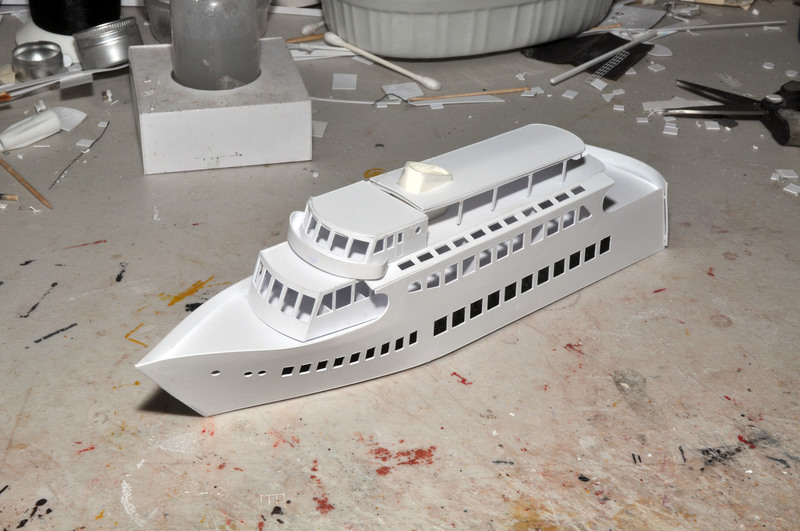 Details such as railings, stairways, anchor, bitts, life rafts, etc.can be determined from the finished pictures below.